The beginning of this book tunes into the pre-2012 zeitgeist, with discussions of paradigm shifts and apocalyptic environmental degradation. It seems to set the scene for a momentous realisation, or at least a clarification of how the world is about the step over a threshold to a new reality. The early hint by the authors that a paradigm shift is the end result of ''accelerating mindsteps' reflects the book itself, which seems to provide a series of those very steps, rather than a leap into the unknown in its own right. Maybe that reflects a maturity on the part of both authors - a growing up from the excitable days of crop circle research: Before the crop artists emerged from the shadowy tree-line to spill the beans. 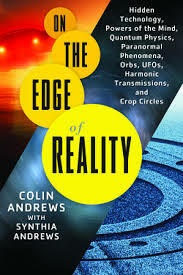 Certainly, the eminent crop circle investigator Colin Andrews has had to re-evaluate his entire way of thinking. It's a brave man who publicly accepts that new evidence has made him undertake such a radial rethink. He now accepts that over 90% of crop circles are man-made, and indicates in this book that the stumbling block preventing him from considering this before was simply a misunderstanding of what might have motivated the crop artists. He just didn't 'get it'. It also seems apparent to me that his marriage to Synthia has opened his eyes to a great deal more besides. The eclectic book visits many realms of mystery as it seeks to discover what lies behind 'high-strangeness events' and their profundity. There's a shift in focus from outside intervention to inner understanding, although I think the book still provides something of a balance between the two - Colin's Yang to Synthia's Yin. The authors argue that the frequency of high-strangeness events are accelerating, although this may simply reflect an 'inattentional blindness' prevalent in less open-minded times (p53). He discusses the realisation that many circles were man-made and that he had ignored evidence to that fact through his own inattentional blindness (p97-9). He admits to a certain naivety, and was flabbergasted that some crop circle researchers were in on it all along. There's an honesty here that is refreshing in this often partisan area of research. Perhaps hoping to remain relevant in the face of this new reality, an argument is put forward that there was a synchronicity between the actions of the crop circles makers and the desires of the crop circle enthusiasts which may indicate that something rather deep was going on, driving the phenomenon forward. He also alludes to several mysterious encounters experienced by circle makers. A crop circle-maker acquaintance of mine gave short shrift to such ideas, fairly easily addressing how the adrenaline flow and environmental factors at play when the circles are (illegally) made play a large part in triggering the imagination of those at work in the dark fields. It's just about humans and art, he says. Moving through the book, the Andrews shift their focus to other areas of interest in the paranormal. There is an excellent section on orbs, for example, bringing together spiritualism, UFOs and crop circles. Colin describes several events that he has personally experienced throughout his life, and how these events shaped his quest for answers. Particularly bizarre are the description of 'black bag entities', which I've not heard of before. The book takes on the mantle of a memoir in places as he reflects back upon decades of research, and places his own unusual experiences within that context. He stresses the importance of revealing profound personal events relating to the paranormal. There's also a slight political overtone to some of the book, as an activist agenda becomes apparent incorporating environmental themes. This harks back to the way the book began, with its warnings of a road to destruction and environmental apocalypse. But such discussions act like book ends to the main body of the text, which is more focussed on crop circles and investigating the weird and wonderful. Synthia also brings with her writing a more New Age message which compliments Colin's more scientific mindset. As the book progressed, it was interesting to note how their partnership has provided acceptance, conciliation and an evolution in understanding of the strange world around us. Although perhaps not ground-breaking, this was an insightful book about the importance of high-strangeness events in our lives, and the very human dimension of their investigation. Subtitled "Hidden Technology, Powers of the Mind, Quantum Physics, Paranormal Phenomena, Orbs, UFOs, Harmonic Transmissions, and Crop Circles"